Hi, this my first build guide. The first time I tried a Flameblast build was back in essence league, I was following a [2.4] video guide made by ItsYoji. I took a long break after essence league, when I stared again in Bestiary that build was completely outdated, and at the time, I couldn’t find any self-cast Flameblast build that wasn’t focused purely on ignite, so I decided to make my own build. I usually only make 1 or 2 characters per league, so I wanted a build that's fun to play and can do most content. I have killed the Guardians, Shaper, Red Elder and Uber Atziri. However, doing them deathless requires good awareness, you need to focus and be able to dodge the boss attacks. I didn't try Uber Elder yet. - Can’t do Elemental reflect maps. First Orb of Storms to increase damage and debuff enemies, then Flameblast to one-shot almost anything that's not a map boss. With Inpulsa, Flameblast will no longer be needed for white monster packs, Orb of Storms + Herald of Thunder + Inpulsa will take care of them. 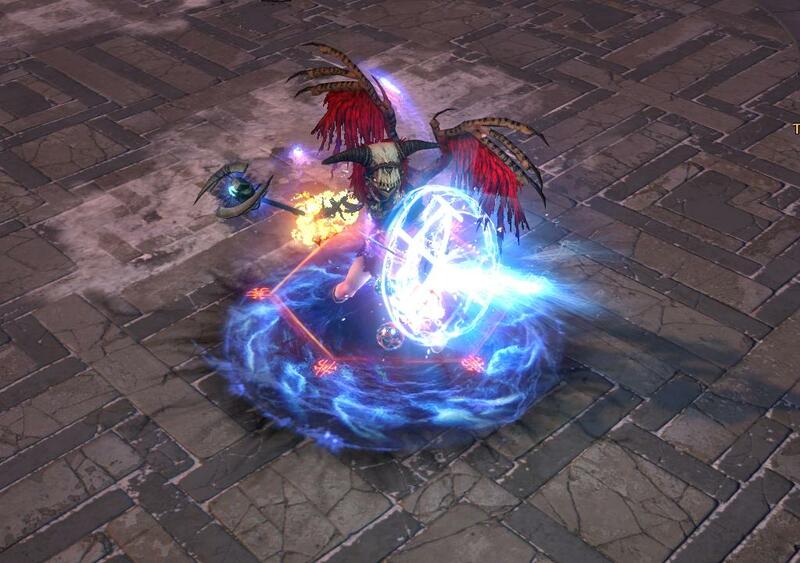 With the Elementalist Ascendancy, Orb of Storms can keep enemies chilled, shocked, and ignited practically 100% of the time. This allow us to use Support skills like Immolate and hypothermia for Flameblast, and combustion for Orb of Storms. It is a highly recommend unique, not a mandatory one. Its name and flavor text fits the "theme" of the build, so I named the build after it. This build has a good EHP pool but low regen and leach (warlord's mark gives plenty of leach while mapping, but not enough when there's only one enemy around), meaning you have to rely on life flasks for bosses. Mobility: Shield Charge + Flame dash. Bandits: We get much better options with 2 skill points. Kill All. Minor: Soul of Ryslatha helps with long boss fights. Major: Anything you want. I went with Soul of Lunaris. Soul of the Brine King is also good for Stuns. Arcane Surge : The required mana to trigger Arcane Surges needs to be equal to or lower than orb of Storms total mana cost. Check Orb of Storms on your skill bar to see the final mana cost. Higher levels lets CWDT trigger higher level skills. But will make it trigger less often. Links are in order of importance. Increased Area of Effect could be better than Faster Casting if you don't have Inpulsa. Elemental Focus has a higher dmg multiplier than Hypothermia, but it removes Flameblast’s ability to chill, shock and ignite. Once we add the ignite dps, Hypothermia ends up dealing about the same dmg without having a drawback like Elemental Focus. 3) Shock enemies making them take 35% to 40% increased damage. This is possible thanks to the Beacon of Ruin ascendancy: "Shocks from your Hits always increase Damage taken by at least 20%”. That 20% scales up to around 40% with the “increased effect of shock” and “increased Effect of non-Damaging Ailments”. (we get 18% from the skill tree, 30% from Unbound Ailments and 25%-40% from inpulsa). 4) Chill enemies to trigger Hypothermia. Any amount of "+cold dmg to spells" makes Orb of Storms chill with every hit. An abyssal jewel with % chance to hinder will give Orb of Storms a good chance to hinder bosses (-30% move speed) due to its fast cast speed. Combustion: With the Stormfire unique ring, Orb of Storms can ignite even when the Igniting Conflux from Shaper of Desolation is not active. Unbound alignments: This is used to increase the effect of shock. It gives a nice damage boost because of the Mastermind of Discord ascendancy: "25% increased Effect of Heralds on you" and "Damage penetrates 25% Fire Resistance while affected by Herald of Ash"
Warlord's Mark is the best way to deal with the high mana cost of Flameblast. Orb of Storms + Herald of Thunder + Inpulsa can kill whole packs of white mobs before you even use your Flameblast. Herald of Thunder is not as important if you don’t have Inpulsa. It can be replace with Clarity if you still have mana problems. This is our source of Fortify, with all the area of effect we have, you can hit enemies from a safe distance and trigger fortify. Fortify can’t be used with wands, you need a scepter to use it. Add increased area of effect if you have a 4th link. Vigilant Strike + the vigil unique jewel gives a 35sec fortify duration. Useful for boss fights, but costs you one jewel slot. Shield Charge tends to get stuck in obstacles if you're too close to them. Flame dash can help when that happens. It’s also needed to cross gaps. With all the cast speed we get from gear and tree, it could be used to dodge boss attacks instead of Shield Charge. But it also have a cooldown, so Shield charge is still needed for general mobility. For the cast speed bonus. Decoy Totem: Optional. It dies pretty fast, but could distract bosses for a couple seconds. Rare specter with cast speed, and as much damage as possible. Damage mods can be: elemental / fire / spell damage, % of elemental damage as extra chaos, area damage, or added lighting damage to spells. Even against the Shaper with 40% fire res, our fire dmg will be increased by 58%, while the chaos dmg will be reduced by 25%. This is a nice unique to use if you can't afford a very good rare. It has cast speed, reduced mana cost and a good amount of dmg if you can keep the enemy hindered. The range for its hinder is not that big, you should get an abyssal jewel with % chance to hinder before using it. This is another cheap unique with really good stats. It can be replaced with a rare with similar stats and Cast speed instead of spell block, and maybe some more elemental resists. But a shield like that won’t be cheap. Using dual scepter, you get around 14% more Hit dmg, but lose some life, energy shield, block chance and the ability to use shield charge. The dmg increase will be higher if you have scepters that are better than the ones i used in this comparison, so if you have two extremely good scepters, dual wield might become the better option. You only have to kill a few mobs in each pack, Inpulsa does the rest. This is not a priority, a rare Chest will give you much more Hp, ES and resists, and is much cheaper. Only switch to Inpulsa if you have good life rolls and enough elemental resistances on the rest of your gear. Stormfire allows Orb of Storms to ignite with lighting damage, so we can use combustion with it for the reduced fire resistance. The consistent ignites will also guaranty that Immolate is always triggered for Flameblast. - Move speed for boots. - One ~30 Dex roll is needed for Inpulsa and Hypothermia. - Shaper helmet with "Socketed gems are supported by Innervate" and / or "Socketed gems are supported by increased Area of Effect", this is not required. Make sure none of your gear has "+ fire dmg to spells" as it will make Elemental Equilibrium increase fire resistance instead of reducing it. Impresence (Flammability version): You get free Flammability with This Amulet. But it requires 4 skill points for Whispers of Doom passive to be able to apply an additional curse. The Pandemonius: it makes Orb of Storms blind with every hit. But it’s expensive. 2x life flask at least one of them with instant recovery. The last flask could be anything you want. The Wise Oak is a good option if your Uncapped Fire res is the highest. At least one flask should have the “of Staunching” Suffix (Removes Bleeding). At least one flask should have the “of Heat “Suffix (Removes Freeze). One abyssal jewel with "adds cold damage to spells" to be able to chill and trigger hypothermia. This is not needed if you have +cold dmg to spells on your weapon. I always like to level with the skills I plan to use at the endgame, so I started using Flameblast as soon as I hit the required level. There are faster ways to level, this is just how I leveled when I made this character. You can start with any spell you want (magma orb, freezing pulse...). Link it with arcane surge. Lv 10: you can start using Shield Charge. Lv 12: Switch to Fire Storm and start using Orb of storms. Lv 16: you can start using Herald of Ash and Herald of Thunder. Don't over Level Arcane Surge! Increased Critical strikes to make Elemental Overlord trigger more consistently. You can start using Flameblast at Lv 28, you should pick some cast speed and area of effect nodes from the skill tree before switching to it. Flameblast has a high mana cost, so start using Clarity. After you start using Flameblast, you can get Elemental Equilibrium from the skill Tree. This will allow Orb of Storms to reduce the enemy’s fire resistance. Any item that "adds fire dmg to spells" will cause orb of Storms to deal fire dmg, making it increase the enemy’s fire resistance instead of reducing it. Get Vaal Flameblast as soon as possible and use it for bosses. Increased Area of effect makes Flameblast much better at clearing packs of mobs. Replace Increased Area of effectit with concentrated effect or Controlled Destruction for boss fights. You can use Increased are of effect for orb of storms too. At LV 34 You can start using Lightning Golem. Warlords Mark gives Mana Leach, which helps with the high mana cost of Flameblast. Using it with Herald of thunder is less consistent, but lets you use faster casting and increased area of effect with Orb of Storms. Using Blasphemy means you'll have to turn off Clarity and / or Herald of thunder. I used it with Curse on Hit and Herald of thunder while leveling. Try all options to see which is better, it depends on your level and gear. At high levels, Blasphemy becomes the best option. Pick the +30 Dex or Str nodes if you need it for your gear requirement while leveling, you can Respec out of those nodes later. From here the order for the skill tree is not too important. Choose between life nodes and damage nodes depending on what you need. The Mastermind of discord ascendancy gives a nice dmg boost and reduces mana reserved. Try to get it as soon as possible. You can start using Immolate with Flameblast and Combustion with Orb of Storms once you get the Shaper of Desolation ascendancy. Don't use immolate and Elemental Focus at the same time until you have Storm Fire equipped. Start using hypothermia (instead of Elemental Focus) once you get the Beacon of Ruin ascendancy and a weapon or jewel with +cold dmg to spells. You can use increased are of effect instead of Faster casting. If you decide to do so, switch back to faster casting once you get inpulsa as you will no longer need to hit the whole pack with Flameblast. Start using Unbound Alignment Once you get the Beacon of Ruin Ascendancy. - This is my first build guide, any suggestion to improve the build or the guide are welcome. Beacon of Ruin makes Shocks increase enemy Damage taken by at least 20%. 20% x (1 + 0.3 + 0.18 + 0.37 + 0.08) = 38%. (0.18 from the skill tree, 0.3 from Unbound Ailments, 0.37 from inpulsa, 0.08 from Helmet). This means 38% more dmg (using my current gear). Checking "is the enemy shocked" will automatically give you 50% more dmg which is not correct. I've been playing self cast flameblast during this league too, i think its in a decent spot. I play a hybrid es/life/mom heirophant, ambystoma on my profile. My top damage is lower than yours, but I have over 2 times your ehp. So far ive cleared red elder and shaper, we will see if uber elder happens. The draw to play hybrid for me is the fact that you can leech es and life at the same time now. I like the fancy stuff you pull off with elementalist + orb of storms. Being able to proc ee and combustion with just orb of storms looks amazing, I have to waste gem slots doing that with seperate spells. Your clear is likely better than mine, I rely on just flameblast+herald of ash with every aoe node on the tree I can reach taken. Tbh I think Cheiftan and inquisitor can work great with flameblast right now as well. Chieftain could easily sustain righteous fire to clear trash mobs and buff flameblast, Inquisitors consecrated ground while standing still has great synergy with a channeling skill. Nice build, bro!! I´ll start it now. Sounds interesting, all that EHP probably makes all bosses pretty easy for you. For me things like guardians with multiple attack mods are dangerous, one wrong move could lead to death. I have enough EHP to not get one-shotted, but a 2nd or 3rd big hit is deadly. I originally thought about a life / ES hybrid but couldn’t get my ES high enough with the gear I could get, so I switched to inpulsa once I was able to afford it. This was before all the new ES leach nodes and gem, not sure how good those will be for bosses with a skill like flameblast that only hits once. I just cleared uber atziri today, build was good enough, but i failed on the first map since i wasn't familiar with mechanics. Once i killed constructs together, killed trio in correct order, and learned to dodge flameblasts everything was fine. Despite all my ehp frenzied construct and atziri's flameblasts were too much to take. The lightning and bleed weren't to bad. When i cleared minotaur I was able to face tank his attacks, only had to dodge his burrow. blind + stormbrand helps a lot vs melee enemies like that. path of building claims i can cap energy shield leech with flameblast, but only get halfway with life leech on a single target. i always carry a life flask just in case. Dont need mana leech, mana regen is enough except on no regen maps with chaos damage- then i have to rely on cinderswallow urn and move fast. I trade off a lot of potential damage for the tank stats- damage is 600k+, can go up to 1.4 mil with cinderswallow urn + vaal righteous fire. 10000 energy sheild, 8500 life+mana so far.